Zebra TLP2844 and TLP2844-Z labels - are available in both direct thermal and thermal transfer - remember, if you are using thermal transfer labels for your Zebra TLP2844, you will need to use a thermal transfer ribbon to print onto the label - we sell Zebra thermal transfer ribbons for the Zebra TLP2844 printers here. The Zebra TLP2844 and TLP2844-Z printers can use both direct thermal and thermal transfer labels. 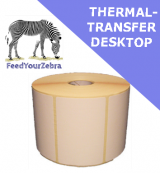 If you are using thermal transfer labels, then you will need to use a thermal transfer ribbon to print onto your labels - you can find Genuine Zebra thermal transfer ribbons for the Zebra TLP2844 printers here. Zebra barcode labels for Zebra TLP2844 printers ensure reliable, high-quality printing. Our Zebra TLP2844 direct thermal and thermal transfer barcode labels are performance-matched to Zebra TLP2844 desktop printers for crisp, dependable output. 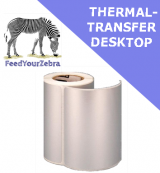 FeedYourZebra supplies only Genuine Zebra direct thermal and thermal transfer labels for the Zebra TLP2844 desktop printer. We've got a great range of labels for the Zebra TLP2844 printer in stock for immediate ship and you can find details of a delivery options here. The Zebra TLP2844 printer has a maximum label width of 102mm and labels are supplied on 25mm cores - please be sure to select the correct labels for your printer.